During the International Comedy Festival Melbourne, a multitude of much-loved comedians descend on Melbourne over a three and a half week period in April. It is one of the three largest and best comedy festivals in the world, alongside the Edinburgh Festival Fringe and Montreal's Just for Laughs Festival. Over 1000 local and international artists compete for audience attention and a variety of comedy awards - in over 360 shows, and over 70 venues. 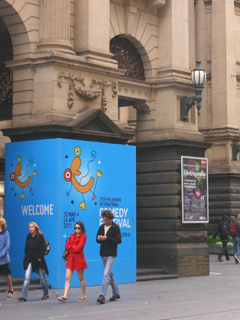 The hubs for the Comedy Festival are the Melbourne Town Hall and the Trades Hall in Lygon Street. With a lot of local and newcomers content, the Melbourne Comedy Festival is less commercial and more friendly and relaxed than the other international comedy festivals. Its considered more fun and less pressure for comedians, hence a fertile ground for creativity. Its "the festival where the comedians go to play. The Festival was started in 1987 by Barry Humphries and Peter Cook. Doug Anthony All Stars and Wogs Out Of Work were some of the original performers. Nowadays, with an attendance of over 350,000, it has become Australia's largest cultural event. 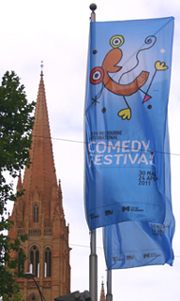 There are hundreds of nightly shows during the Comedy Festival Melbourne. They are mainly stand-up and cabaret acts, as well as some sketch shows, plays, improvisational theatre, debates, musical shows and art exhibitions. The Opening Night Super Show, a sell-out, explosive event with the worlds best comedians passing the parcel, pinning the tail and, most importantly, telling jokes and being the life of the party. Deadly Funny, Australias only Indigenous and Torres Strait Islander comedy competition that celebrates the unique humour of Indigenous Australians. To enter the Comedy Zone is a risky undertaking & you're likely to laugh your head off. The (Very) Big Laugh Out, FREE! A massive magical program of the funniest family-friendly performers from around the world! Snaking from City Square to Fed Square and along the Yarra Precinct. There are also discussion panels, readings, art and comedy tours. A number of the Comedy Festival Melbourne shows are accessible to patrons who use AUSLAN (Australian Sign Language). There is also a Roadshow that travels with the Comedy Festival highlights and a cast of big local names, newcomers and overseas guests to the rest of Australia  from Devonport to Darwin, and Broken Hill to Bunbury, and even Singapore. There is some grumbling amongst comedians, suggesting that the festival has a detrimental effect of causing Melburnians to overlook their local comedy scene. It makes people forget that comedy happens in Melbourne throughout the year  not just in April! Local comedy venues are struggling due to low attendance and are threatened to close. This robs local comics of their chance to trial, polish, develop and perform their material. It also puts them under the pressure of having to compete with international sponsored acts. But to set the records straight, the Melbourne comedy scene is alive and pumping all year round. There are shows, many opportunities for emerging comedians to develop their skills, as well as open mic comedy competitions. The annual Melbourne International Comedy Festival is the culmination of ongoing comedy activities and, for three and a half weeks each year, makes Melbourne the centre of the comedy universe.